At just six inches long and weighing a meager four ounces, the ortolan is the petite imp of the bird world. His delicate greenish head and penchant for hopping around close to the ground are fitting to his name, from the Latin hortulanus, which means "the gardener bird." Despite all this, chefs in France and elsewhere are intent on a practice that threatens the survival of the rare bird. A piece that appeared in The New York Times this week delved into the French culinary tradition of capturing ortolans, overfeeding them in complete darkness for 21 days, drowning them with Armagnac, roasting them and then eating them whole, in one steaming bite. Gourmet chefs maintain that the custom, which involves eating the bird hidden under one's dinner napkin, is a treasured one in France. But conservationists and animal advocates say that the tradition is outdated and, given the bird's precarious status, must end now. 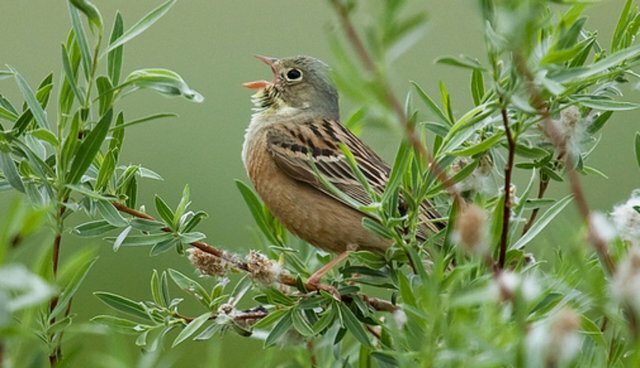 Despite a European Union ban on hunting the protected species in 1979, some 30,000 wild ortolans are killed in France every year. The demand by gourmands has already taken a toll - the population fell by more that 40 percent over the past decade. Conservationists say that not only is the practice cruel (not to mention illegal), but it's hurting the bird's population. While not listed as endangered, they worry that local populations could be wiped out by poaching. "Chefs and foodies who believe they need to kill an endangered bird to keep their food creations interesting are lacking in creativity," Gene Baur, President of Farm Sanctuary, told The Dodo. "And, they are also lacking in compassion." I urge you to make every effort to ensure that this season of ortolan poaching is the last. Concerted action by means of the state (national and prefectural level), police and judicial bodies must be deployed to stop the application of a customary law that not only undermines the biodiversity, but tarnishes the international image of France.